As one of the oldest cities in the nation, Savannah exudes old-world charm. You'll find history and Southern charm at every turn. Explore the city and experience inspired architecture, historic cemeteries, vibrant nightlife, delectable food, and global sophistication. From shopping in upscale boutiques and antique shops to strolling along the Landmark Historic District, you'll find something for every taste.The Gastonian is located only two blocks from Forsyth Park and within easy walking distance to a number of city squares, including Whitefield, Calhoun, Monterey, Troup, Lafayette, and Madison. It's a five-minute walk down Lincoln Street to Colonial Park Cemetery, and from there, just a few blocks to the Juliet Gordon Low Birthplace on Oglethorpe Avenue. Savannah's River Street and City Market are about a mile from Forsyth Park and the Gaston Street area. It's a pleasant stroll with lots of photo opportunities through neighborhoods of elegantly restored homes and beautiful gated gardens. 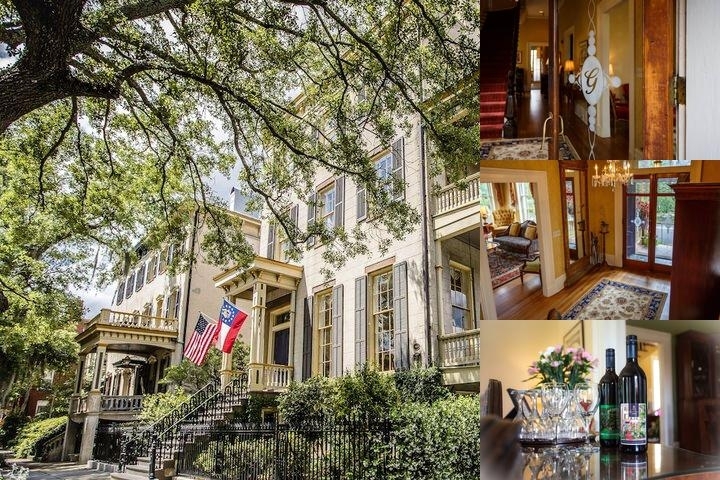 A four-diamond, award-winning bed and breakfast inn, voted by Condé Nast Traveler as one of the top 50 B&Bs in the world, The Gastonian truly is the most luxurious of the Savannah historic bed and breakfast inns. Set in a residential neighborhood on Gaston Street near Forsyth Park, The Gastonian is known for its intimate atmosphere, authentic antiques, grand décor, and charming hospitality.The Gastonian is comprised of two adjacent mansions, both of which were built in 1868. Constructed of local handmade bricks, the mansions feature white stucco in clean-lined Regency Italianate style. The freestanding house at 220 East Gaston Street was built for Savannah insurance broker R. H. Footman, and the one next door, 218 East Gaston Street, was built for wholesale grocer Aaron Champion.Situated on the corner of Gaston and Lincoln Street, The Gastonian's location is integral to its appeal, offering guests a wonderful place to stay that is both charmingly residential and central to Savannah's popular historic sites. Guests of The Gastonian experience the unique charm and sophistication of an elegant historic Savannah home.Savannah-Centric Place to StayThe Gastonian is two blocks from Forsyth Park and within easy walking distance to a number of city squares, including Whitefield, Calhoun, Monterey, Troup, Lafayette, and Madison. It's a five-minute walk down Lincoln Street to Colonial Park Cemetery, and from there, just a few blocks to the Juliet Gordon Low Birthplace on Oglethorpe Avenue.Savannah's River Street and City Market are about three-quarters of a mile from the Forsyth Park and Gaston Street area. Enjoy a pleasant stroll with lots of photo opportunities through neighborhoods of beautifully restored homes and lush, gated gardens. You'll find eclectic shops, rich historical sites, and delectable cafes along the way. With Group bookings we do require either a 10% deposit or 1st night (with Tax) deposit for each room, depending on the size of the Group. Local Shuttle Info: Two Blocks away towards Forsyth Park there is a Free DOT Shuttle pick up that runs from 9am to 5pm Monday to Saturday. We serve fresh made to order complimentary breakfast for our guest each morning in our dining room. Complimentary tray service is also available for our guest that would prefer to dine in their room, patio, balcony, or shared Veranda. Complimentary Parking for all our Guest. Complimentary High-Speed Wi-Fi for all our Guest.